Looking good... keep it up. Thank you so much, Jad; It still needs a lot of work-- the brunette looks like her features are painted on so I'm going to tweak it with normal and displacement maps for both of them to see if I can make them more 3 dimensional as well. I've been immersing myself in Daz and Reality and the first thing I did when I sussed out how to use Reality's dof was to re-render my pool party scenes in Reality with a dof; I've even redone the twins because I moved the sun to get a richer skin tone. 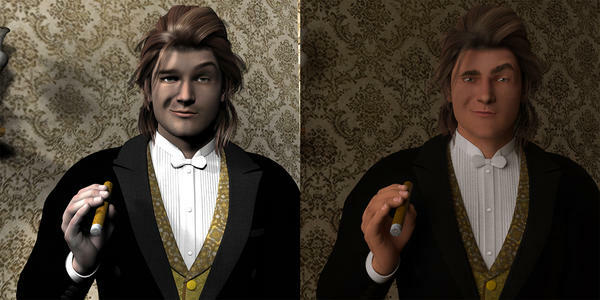 I've also finally gotten how to use shaders; thank you so much to the people here who shared their knowledge :cheese: I did a study of a Victorian "gentleman" as I'm working on a render inspired by The Picture of Dorian Gray. The lights and skin are different because of the way 3Delight and Reality handle each. The one on the left is 3Delight and I've finally learned how to apply shaders so this has the Elite Human Surface Shader; I'd found Interjection much too strong but there's a still lot I have to learn about shaders in general. The one on the right is Reality, rendered for 24 hours (give or take). No postwork/color correction in either render. Certain police officers have a peculiar physiognomy, which is complicated with an air of baseness mingled with an air of authority…The human face of Javert consisted of a flat nose, with two deep nostrils, towards which enormous whiskers ascended on his cheeks. One felt ill at ease when he saw these two forests and these two caverns for the first time. When Javert laughed,—and his laugh was rare and terrible,—his thin lips parted and revealed to view not only his teeth, but his gums, and around his nose there formed a flattened and savage fold, as on the muzzle of a wild beast. Javert, serious, was a watchdog; when he laughed, he was a tiger. As for the rest, he had very little skull and a great deal of jaw…Between his eyes there was a permanent, central frown, like an imprint of wrath; his gaze was obscure; his mouth pursed up and terrible; his air that of ferocious command…This singular composite of the Roman, the Spartan, the monk, and the corporal. Marius Pontmercy. Went for the black curly hair of Michael Ball (and others) as well as the dreamy nature criticized by Enjolras. I tried to capture the way he's depicted in the musical: passionate, loyal, heroic, rather than the way he is in the book which is admittedly a good deal more complex and a product of its time.